Â Heavy cream, also known as whipping cream, is an ingredient that is frequently called for in recipes. Cream is the thick, fat-rich part of milk, which rises to the top when milk is fresh and is skimmed off. The type of cream is determined by its fat content. Heavy cream has a fat content between 36 and 40%. A high milkfat will add tenderness and moisture to a baked good, just like adding most other types of fat. For instance, many scones are called cream scones because they are made with cream. It is certainly possible to substitute some other type of milk for the cream in these recipes and have them come out, but they won’t be nearly as tender or moist as a scone that is actually made with heavy cream. Heavy cream is also used to make whipping cream. The fat in the cream is what helps stabilize it after it is whipped, and why you can’t whip just any old dairy product into whipped cream with a whisk. The fat also prevents the cream from freezing too hard when it is used in ice cream, leading to a creamier finished product. There is one type of heavy cream, called manufacturing cream, that is used commercially by bakers, cooks and bakeries. 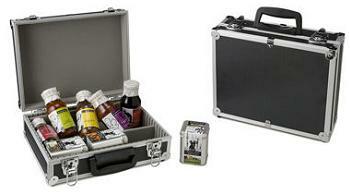 It has an even higher fat content of 40-50%. This can be substituted to regular heavy cream (it is often found at bulk stores, but would not be found at a grocery store with regular cream), but otherwise there are no real substitutes for heavy cream when you need it. The fact that heavy can whip and hold its structure so well makes it unique. And because its high fat content gives lightness to all kinds of dessert, from featherweight mousses to silky ice cream to tender scones, it is an ingredient that is generally worth using when called for to get the best results you can. Is there a technical difference between creams labeled “heavy cream” and those labeled “whipping cream”? Sometimes I see both in the store. I get raw milk, and I’ve often wondered if I could skim the cream off the top and use it for recipes that call for heavy cream? I am surprised you are showing ultra-pasturized. It doesn’t whip as well or hold as long. Heidi – Nope, they’re the same thing! Wendy – Yes, you can use that for recipes that call for heavy cream. I’ve also seen raw cream sold in some markets. Raw cream is also great for making butter. Brenda – It just happened to be a picture that I had in my archives. I agree, but the difference isn’t so dramatic that I would necessarily recommend against getting ultra pasteurized. While markets around me carry pasteurized cream, most of it seems to be ultra pasteurized these days. I wasn’t intending the picture to mean that I only recommended ultra pasteurized cream. Here is some more info on ultra pasteurized cream and dairy products: http://bakingbites.com/2010/09/what-does-ultra-pastruized-mean/ Thanks for asking! Since you did picture one indicating ultra-pasteurized have you noticed any difference between that cream and one only pasteurized? 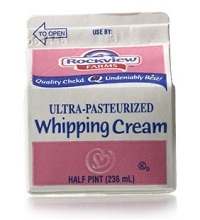 I read some time ago that the extra processing to the cream lessened the whipping volume. I don’t know if that is true or not–I tend to avoid ultra-pastuerized and only purchase one that indicates pasteurized only. i have read a few things that suggest using silken tofu (whipped in a processor) to replace cream — any idea if this is crazy or brilliant?? In first year at uni I used to leave a tub of ben and jerrys on my windowsill if I hadnt finished it as it would get eaten by someone else if I used the freezer. So then I would have it for breakfast and it would be all moosey and chilled from being next to the open window. Hi, I have to nitpick and say that products labeled whipping cream are ultra-pasteurized and stabilized with carageenan, whereas heavy cream is just that, cream. is heavy cream also whipping cream when it comes to cooking as i chicken Alfredo? Clarissa – Yes, you can use whipping cream when making chicken alfredo or making other cream sauces (like a vodka sauce or something). Can I substitute half and half for heavy cream in a recipe as long as it is not to be whipped? Tina – Yes, usually you can do that. It depends a little bit on what the recipe is, but half and half is essentially half heavy cream and half milk. What is the best brand of whipping cream? Not sure which one to use. If I make a white supreme sauce for chicken breasts, using chicken stock cubes, butter, wheat flour, whipping cream and possibly chedder cheese, can I freeze the excess sauce and defrost it for another meal later ? If so, what type of container should I use ? The article refers to fat content between 36-40% … In Canada, whipping cream is35%… Can it still be used for making ice cream? Why the difference between the two countries in how they define heavy cream? S – I can’t tell you why there is a difference, but the Canadian cream will be just as good for making ice cream, so you should be fine with it! Hi, as you already said that whipping cream can be used as an alternative for heavy cream since they don’t sell it in Australia. I’m making a chocolate tart on the weekend and says to use heavy cream if I use normal whipping cream will it have an effect on the tart??? Jeshnita – Good question! I think that your tart will turn out just fine with that substitution. Hi! I wanted to make vanilla ice cream and the recipe calls for heavy cream. Is there a difference between heavy cream and whipped cream? And if I use whipped cream will I get a different result? Anne – Whipping cream (that is not already whipped) is essentially the same as heavy cream and can be used in your recipe.